Many skin disorders occur more frequently and with increased severity in people with Down syndrome, e.g. dry skin, folliculitis etc. The treatment of the skin disorders is the same, as for the general population. 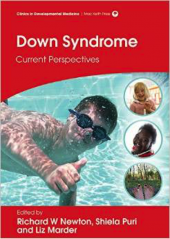 Some rare conditions are specific may be representative of an underlying systemic condition in Down syndrome, warranting further investigations e.g. Leukemia cutis or neonatal blistering eruptions, may represent a marker for transient myeloproliferative disorders. Carotenemia, is an orangish hue discoloration involving the palms and soles of the feet and the nasolabial folds but sparing the sclera. This may occasionally be associated with hypothyroidism, myelodysplasia and diabetes. Though more commonly is due to a diet rich in ? carotene. Elastosis perforans serpiginosa, these are scaly red papules a few mm across, arranged in lines or rings a few cm across. These usually resolve spontaneously but may be a marker of Moya Moya disease. The treatment of the skin disorders is the same as for the general population. The conditions that may be associated with systemic conditions should be investigated promptly. Dermatological manifestations of Downâ€™s syndrome.Madan V, Williams J, Lear JT (2006) . Clin Exp Dermatol 31:623-629.